Learn how the Link point can be used and see it in action with the sample projects. What is the Link point? The Button point can be used to create a link to a page within the open project or to navigate to a website or a Url Scheme . Easily create a table of contents page with links to each page. One of the many uses of the Link point is to create links between the pages of a project to create a table of contents. This can be done automatically from the Mobile Data Anywhere Designer. With the design window open for a project, select Edit -> Add Contents Page to create a new page with links to each page of the project. The page and URL links can be populated using the values of other points to construct dynamic links. To add a dynamic reference to another point you will need to add the point's ID to the setting using the following format: . For example, to dynamically construct a URL to call a phone number that is stored in an Edit point with the ID, BusinessPhoneNumber , the Link point's URL setting would be: tel: . The Link point can be configured in the Mobile Data Anywhere Designer to customise its appearance and behaviour when pressed. Below is an example of the properties window for a Link point, in the Mobile Data Anywhere Designer. This is the text that will be displayed for the Link point, which can be tapped to activate the link. When an image is added to a Link point, you can remove the caption to only display the image. Allows you to select a page from the current project which will be opened when the Link point is tapped on the mobile application. Allows you to set a URL which will be opened when the Link point is tapped on the mobile application. The URL can be a link to a website which will be opened on the device's default browser or it can be to a URL Scheme which can perform powerful functions such as creating, opening or sending a session and much more. When enabled, the point will activate its link actions when an associated Logic point's conditions are met. 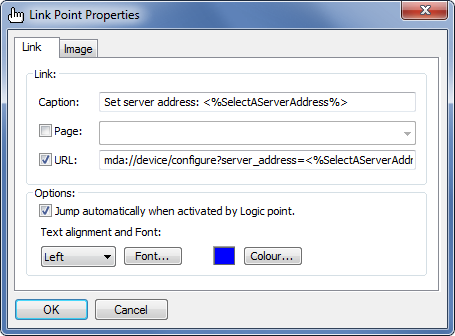 For more details on how to setup a Logic point to do this, see the sample project below. These options provide a standard editor for customising the font, font style, size and effects as well as alignment and colour. The image properties tab allows you to import an image into the point, to be displayed on a session. A thumbnail preview of the image will be displayed on the left. Enabling High DPI will scale the image to a smaller size but a higher quality. When an image has been added to the point, the caption is not required. In the provided sample project, basic_point_samples.ppc there is a page for the Link point , which demonstrates how a Link point can be configured to link to pages and URL's. Open this project in the Mobile Data Anywhere Designer for a closer look at how each point has been customised on each point's properties window.